These Aqua Creams have been a staple for me this summer. They are completely waterproof and stay on incredibly well for as long as you need them to. For example, the other day I was wearing one of these and even after working out and literally dripping with sweat (really attractive I know), the eyeshadow was still on! It hadn't even budged, I couldn't believe it! I knew these shadows stayed well but I didn't think anything could survive a workout unscathed. 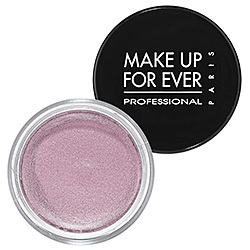 They are very similar to their cheaper counterpart, Maybelline Color Tattoos, except in my opinion Makeup Forever provides more and better color options. There are roughly double the colors in Aqua Creams and in my opinion there are more wearable options. Maybelline Color Tattoos have some amazing colors, but there aren't as many light neutrals like pinks and nudes that are provided by the Aqua Creams. The Makeup Forever shadows have crazy colors, but they also provide incredibly wearable colors that are so easy to just throw on before leaving the house. This product is fantastic for quick, easy morning application. It is basically effortless to apply this cream shadow, and you won't have to worry about it creasing. The Color Tattoos are resistant to creasing as well, but in my opinion the Aqua Creams are even more so. The great thing is you DO NOT need a primer with these shadows. Not needing to apply a primer makes application even quicker and easier. You can use these as a cream base for a powder shadow, or on their own, and they look fabulous either way. They contain mother of pearl pigment that creates a luminous but not overwhelming sheen. These shadows are very easily blended but you need to blend them rather quickly so they don't set. Now for some downsides. The first thing I noticed about these shadows was the packaging. Other cream shadows like the Color Tattoos and MAC paint pots are encased in small glass jars, which make them feel very high quality and luxurious. I was surprised to find out that the Aqua Cream shadows have light plastic packaging. It makes them feel very cheap. This isn't a deal breaker, but it's just a small detail that detracts from the overall rating of the product. On the upside, the plastic packaging makes these shadows lighter and therefore easier to carry around in your makeup bag. Secondly, although the pigmentation and application are really nice, you may need 2-3 coats to achieve a completely flawless and patch free appearance. I have noticed when products are waterproof and stay for a long time, they tend to go on patchy at first, I'm not sure why that is, but it's the case with these Aqua Creams and was also the case with the eyeshadow crayons I reviewed in a previous post. I often will just put one layer on and it looks fine, but if you want a completely opaque application, you make need 2-3 coats. Lastly, but importantly, the price. Frequently when I review higher end products the price has to be listed as a downside. These Aqua Creams are very pricey compared to the Color Tattoos and just in general. They are $23.00 a pop. If you make sure to close the lid tightly, they will last a long time because you use such a small amount each time, but it might not be worth the price for a lot of people.